This all-ages, family-friendly show is an opportunity for our students of all levels to show off their skills in a supportive environment. Get ready to meet aliens and astronauts in aerial performances inspired by astronomy, astrology, science fiction, and technology. 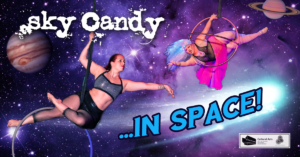 “Sky Candy in Space” coincides with Yuri’s Night. Yuri’s Night is a global celebration of humanity’s past, present, and future in space. Parties and events are held around the world annually to commemorate Yuri Gagarin becoming the first human to venture into space on April 12, 1961. Starting with this show, Sky Candy Student Showcase tickets will now be available in advance! Advance tickets are $4 for current students and $8 for non-students. Door tickets will be available for $5 for students and $10 for non-students. Proceeds from Student Showcases help us pay our crew for facilitating these performance opportunities and allow us to make improvements to our lighting, sound, and seating in our new performance space!